Chase the Winter Soldier in Black Panther's awesome jet! Fire the jet's stud shooters at Winter Soldier as he speeds away on his motorbike. Dial up high-speed action with Captain America's 4x4. Fire the 4x4's spring-loaded shooter and throw Captain America's shield at the jet flying above! Will Black Panther capture Winter Soldier or can Captain America help him to escape? Color(s): multi. Brand: LEGO. 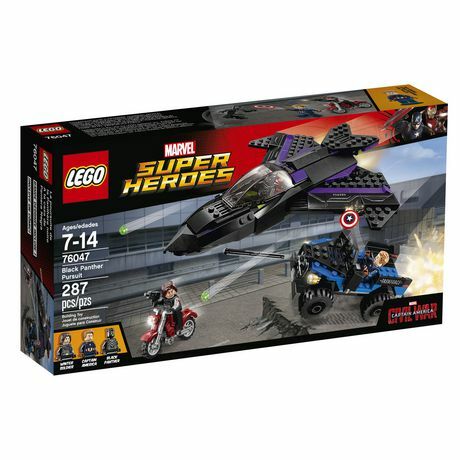 Style Name: Lego Marvel Super Heroes Black Panther Pursuit - 76047. Style Number: 5242927. Available in stores..